A truly special "Special Edition" instrument, this 414ce Grand Auditorium features many custom elements artfully incorporated by Taylor Guitars' Master Guitar Designer, Andy Powers. Indian rosewood is one of the most popular and musically expressive tonewoods in the world, and, paired with Sitka spruce, produces a rich and detailed sound. Taylor's Grand Auditorium shape and rosewood's balanced, broad sonic range and complexity - and, of course, Taylor's renown playability - result in a guitar that will be a joy to play in a variety of scenarios for a lifetime. 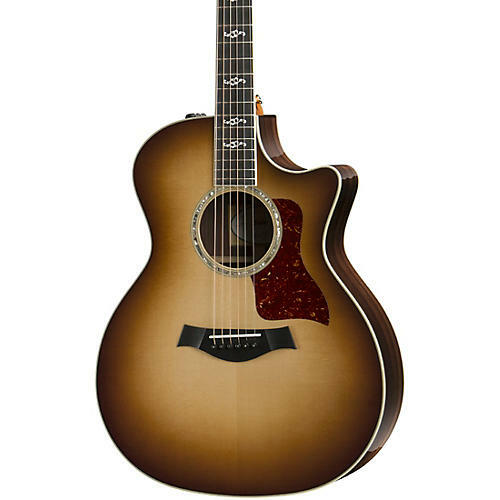 Taylor's 414ce Special Edition Grand Auditorium acoustic-electric ships in a deluxe hardshell case made by Taylor for optimal fit and protection. A Taylor original, the Grand Auditorium helped establish the Taylor acoustic sound. The popular body style makes for a versatile guitar that yields ample volume in response to light fingerpicking, and reacts to medium strumming and flatpicking with a clear, balanced sound across the tonal spectrum. If you want a great all- purpose guitar, the GA is an excellent choice.